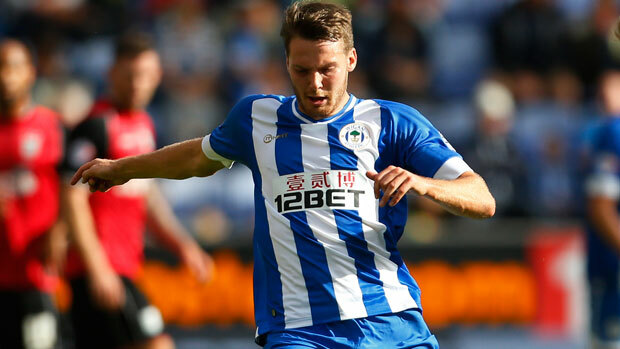 Nick Powell had a big initial impact as a loan player for Latics. The words of Mick McCarthy on Patrick Bamford winning the Championship Player of the Year award ahead of his own Daryl Murphy and Watford’s Troy Deeney. The choice of the 21 year old Bamford for that award raised eyebrows among many fans of Championship clubs. Bamford is technically a Chelsea player, although he has never actually played for them. He was signed from Nottingham Forest for £1.5m, in January 2012, but loaned out to MK Dons, Derby County and Middlesbrough. In fact this season Chelsea loaned out no fewer than thirty four players. Eighteen went overseas, two to Premier League clubs, the remainder to the Football League. Also among those loaned out was Josh McEachran, who looked like he was going to be a key loan signing for Wigan Athletic last year. McEachran had been a star at youth level, with a combination of vision and skill that made him look an England player of the future. Before joining Latics in January 2014 he had already been on loan at at Swansea City, Middlesbrough and Watford. This season he was dispatched to Vitesse Arnhem. McEachran made five league starts and two in the FA Cup for Latics in a disappointing stay. It is now doubtful that the player, now 22 years old, will ever play for Chelsea again. Is McEachran’s failure to realise his potential due to a lack application or have all those loan spells undermined his self-belief? Wigan Athletic had no less than 11 loan players at various times during the 2013-14 season under Owen Coyle and Uwe Rosler. The most notable of them was Nick Powell, who for a while gave the forward line a cutting edge and unpredictability that has not been since evident. Sadly injury and loss of form led to Powell fading away in the second half of the season. This season Manchester United loaned him to Leicester City, but the Foxes cut his loan prematurely in December, citing a lack of commitment to training. Coyle had prided himself in being an adept user of the loan system during his spell at Bolton, where he had worked with young talents such as Daniel Sturridge and Jack Wilshere. Rosler had used the loan system at Brentford to bring in players with a view to future signings, Adam Forshaw being a prime example. Only one of those loan players in 2013-14, Martyn Waghorn, was to stay at the club. Nine of the eleven had experience of first team football in the past, with Tyias Browning and Will Keane the exceptions. Interestingly after returning to their clubs or joining new ones, none of the eleven were to become regular first team players this past season. In return Latics sent eight players out on loan to other clubs, including Grant Holt to Aston Villa. The loan system has become a big feature of modern day English football. The big clubs use it to effect in developing players and reducing their salary costs at the same time. Clubs taking players on loan not only usually pay their wages, but give players valuable first team experience. Cash-strapped Football League clubs use it as a means of recruiting players without having to deal with long-term contracts that can be a noose around their necks. Chelsea have been exceptional in using the loan system to get better value out of their players. They recruited Romelu Lukaku from Anderlecht for £13m in 2011, then sent him on loan to West Bromwich Albion and Everton, until the latter club paid £28m for him last summer. Also in 2011 they signed Thibaut Courtois from Genk for around £8m, but within weeks they sent him off on loan to Atlético Madrid. Courtois was to establish himself as one of Europe’s outstanding goalkeepers during three years in the Spanish capital. Chelsea have also made a big investment in their academy and their teams won both the FA Youth Cup and the Premier League under-21 competition last season. The majority of their successful young players are sent out on loan to clubs in lower divisions, where they will meet a physicality and competitive edge way beyond that of the under-21 competitions. Bamford has certainly made the difference at Middlesbrough, who were in 12th place last year but are now challenging to promotion through the playoffs. It is no coincidence that Bamford went to Boro after a successful loan at Derby, given that Aitor Karanka, ex-assistant to Jose Mourinho, is their manager. How Wigan Athletic could have used a talent like Bamford this past season. Of the nine players signed on loan only one was a striker, Jerome Sinclair. Unfortunately the 18 year old, signed in March, was to make just one appearance, as a substitute. Due to the mass exodus of players in the winter transfer window, Malky Mackay had to bring in a lot of new blood. He signed two players on permanent contracts for modest fees and three free agents. By the closing of the transfer window on February 2nd he had signed four players on loan. He later used the emergency loan option to sign up three more young players. According to Football League rules a club can have a maximum of five loan players in a match day squad of eighteen. Standard loan rules allow clubs a maximum of four players who are under 23 and a further four over 23 per season. It is the player’s age on June 30th prior to the start of the season that is taken into account. Emergency loans exist to cover clubs for injuries and suspensions. But in reality clubs use them as a short term measure of bringing in fresh blood. The two emergency loan windows operate from August 31st to the fourth Thursday in November and from the beginning of March until the fourth Thursday of that month. Mackay brought in Sinclair and Josh Murphy during that latter period. Mackay came under criticism for bringing in young players on loan from other clubs and giving them match time at the expense of the club’s homegrown talent. But Gary Caldwell was to give opportunities to Tim Chow, Jordan Flores, Lee Nicholls and Louis Robles from the development squad during the five games remaining. Interestingly, none of the young trio of loanees – Murphy, Ojo or Sinclair – taken on by Mackay even made the bench in the final two matches. Given the pattern of the past couple of years we can expect Wigan Athletic to have some 5 or 6 loan players in their squad. However, Caldwell will most likely seek more experienced loan players while at the same time providing opportunities for homegrown talent. Mackay’s signing of inexperienced youth loanees on short-term emergency loans smacked of desperation. It is something Caldwell will surely avoid, preferring to send a message out to young players within the club that it is possible to progress through the ranks to the first team. One wonders if Caldwell can use the loan market to unearth another player with the skills of Nick Powell, but with the application of someone like Patrick Bamford. Good strikers cost a lot of money. Having been unsuccessful before Wigan Athletic will baulk at splashing out a large sum on a striker who might not come off. The loan system has become an integral part of life for Football League clubs in an environment dominated by the financial might of Premier League clubs like Chelsea. However, it is a tool that Wigan Athletic can use to their advantage if they are judicious in its use. Only time will tell if Caldwell and the club’s recruitment team can use it to transform the club’s season.